The pair of rival populists who had agreed to forge a governing coalition together exploded in anger after President Sergio Mattarella announced at the Quirinal presidential palace that he was refusing to appoint a minister whose views could rattle already nervous markets and drive up Italy's already staggeringly high debt. Luigi Di Maio, who was determined to see his anti-establishment 5-Star Movement, Parliament's largest party, achieve government power for the first time, raised the specter of a move to impeach Mattarella, who, as head of state, must give his approval to any new government. "If we go to vote (again) and we win, and then we go back to the Quirinale and they tell us we can't go into a government, for this I say, we must put the president under accusation" in Parliament, Di Maio said in a phone call to a late-night talk show. Right-wing leader Matteo Salvini, who overcame rivalry with Di Maio to try to forge a coalition with him, told a rally of his League party supporters after learning his pick for economy minister was rejected: "If we're not free to decide, better to go back to vote." He added: "we're not a free country" but have "limited sovereignty." The political novice and 5-Star supporter selected by Di Maio and Salvini to be premier told reporters at the palace he had tried his best but didn't succeed, four days after Mattarella formally gave him a mandate to try to form the government on behalf of the populists. 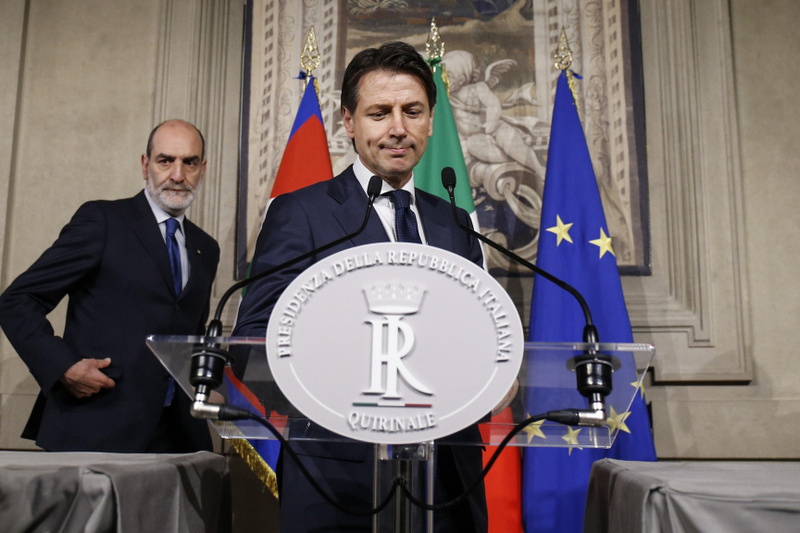 "Good luck to anyone" who next gets tapped by Mattarella to be premier-designate, Giuseppe Conte, a law professor at the University of Florence, told reporter. He said he did best to try to give the country "a government of change." An irritated-looking Mattarella said he would reveal his next move "in a few hours." Italian media said the president would convene Carlo Cottarelli, an economist who assisted a former center-left government, to the palace late Monday morning. Mattarella was expected to ask the former International Monetary Fund official to assemble and lead a government of "technocrats" until early elections. But as analyst Wolfango Piccoli noted early Monday that such a government risks losing mandatory confidence votes in each chamber of Parliament. The 5-Stars and the League together command just over half the lawmakers' seats. "This means that Italy will be left with no effective government backed by a clear political majority in Parliament until the end of the year," said Piccoli, co-president of Teneo Intelligence. "The main risk is that the stand-off will further embolden the 5-Star Movement, and, especially, the League. The two populist parties will blame the 'establishment' for denying them the right to govern," Piccoli said. Mattarella had previously warned that if a political government failed to take shape, he would be forced to appoint a non-political premier to guide the country to fresh elections before year's end. On Sunday night, he said he would "dutifully" consider requests by political parties for early elections. Salvini had virtually given an ultimatum to Mattarella over his pick for economy minister, Paolo Savona. Mattarella told reporters he had approved all of the coalition's Cabinet candidates except that of Savona. "The designation of the economy minister always constitutes an immediate message of trust or alarm" for financial markets, Mattarella said, adding that he insisted on some someone who was not "supporting a position expressed more than once that could probably, or in fact inevitably, provoke Italy's exit from the euro." Last week, the spread of points between Italy's bonds and benchmark German bonds grew alarmingly, and Milan's stock market suffered losses as investors were spooked about the intentions of the populists. "The losses in the stock market, day after day, burn resources and the savings of our companies and of those who invest in them," Mattarella said. "And they portend concrete risks for the savings of our fellow citizens and for Italian families." Outgoing Economy Minister Pier Carlo Padoan contended that the real problem wasn't Savona, but the "clearly unsustainable" platform of a populist government "that doesn't rule out a Plan B: that is, in the face of European pressures, one must leave Europe." With the prospect of elections possibly looming in a few weeks or months, Salvini might see a boost in what already has been steadily growing popularity, said political analyst Maurizio Molinari, who is La Stampa newspaper's editor-in-chief. Salvini was "much stronger" in opposing Mattarella, posturing that could expand his sovereignty-leaning base, Molinari said. The League has triumphed in several recent regional elections since March 4.